When you determine the font you are going to use for an HTML document you have to realize that when an end user views that document in their browser they can only see fonts that are installed on their system. That means that if you set the font of your HTML document to "My Fancy Unique Font" and your end user doesn't have that font installed, they won't see it. 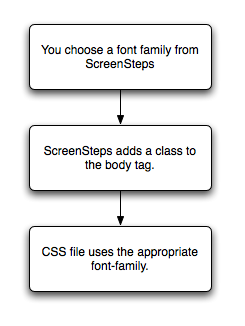 In ScreenSteps we let you select a font-family for HTML templates. But all this does is add an html class to the body. 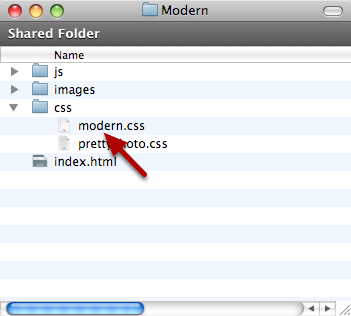 The CSS files in the default HTML templates then know what to render for each class. Here is an example from one of the ScreenSteps HTML templates. Here you can see the font-family declarations for each class. So if you select "Courier" as the font for your template, ScreenSteps adds the class "courier" to the body tag and the CSS file sets the font accordingly. These are common fonts that are available on the vast majority of operating systems so you content should look pretty close to the same on various systems. How Do I Set My Own Font? It is very simple. Just add a CSS style with the font you want to use. You will need to modify one of the stock templates or create one form scratch. Open the HTML Templates preference pane (1) and select the Lesson, Manual or Clipboard tab (2). 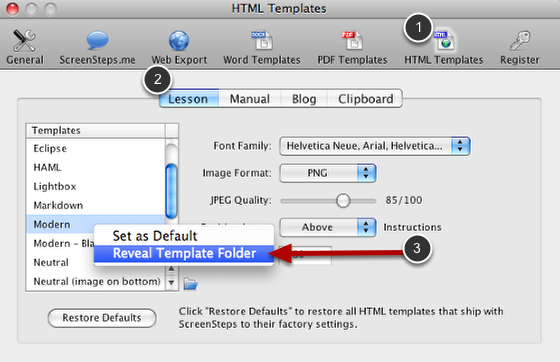 Right-click on the template you would like to customize and select Reveal Template Folder (3). Open the css file in a text editor. Comment out the font-family settings starting with a /* and ending with a */. Then add your own font-family setting. That is all there is to it. You can add multiple fonts in a list. The user's computer will try to load each font in the list until it finds one that matches a font the user has installed. Next: How Do I Make The Image Appear To the Left of the Text in an HTML Template? Still, there should be a way to use a font that the end user can see despite not having it installed on their own system. Anything else can be uploaded on the server and published, so why not for example upload a specific font used in the template that end users have access to when they see/ upload a site? Can't believe nobody thought of a code yet to make it so. Specific Brands use specific fonts for their logo/name. So it always needs to be an image?? You can take a look at Google Fonts. It may not have the exact font for your logo but it has a lot of additional fonts.